This was a fun read. It got a bit slow in the middle, but kept me reading. I didn't find it as hilarious as some did -- though the beginning and end both were. I think many, myself included, benefit from the gentle, humorous reminder that we can't control all of life, and trying to do so makes us less happy. The first-person perspective was handled very well, and I had to remind myself that this wasn't necessarily autobiographical. That well. 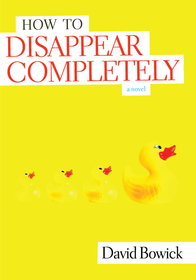 Sign into Goodreads to see if any of your friends have read How to Disappear Completely.